The NetLetter came about in 1995 as the result of the desire of Vesta Stevenson (now deceased) to create a weekly newsletter for Air Canada retirees. Vesta, who resided in Victoria, B.C., knew what she wanted to do, and although a "techie" with computers, she didn't know how to create a mail list. Remember, this was in 1995 when the Internet itself was fairly new and there weren't nearly as many mail lists and websites as there are now, so we were on the cutting edge of technology. Soon after, through email, Vesta contacted Terry Baker who also lived on "the island" and they started an online collaboration that would last until her passing on July 25, 2010. That same year Alan Rust (in Surrey, BC) offered his expertise and resources for the actual sending process through a mail list as well as technical support, this continues to this day. We believe that our NetLetter, which originates from Vancouver Island, British Columbia, was the FIRST to use this medium to disperse information for retirees of the Air Canada and, after the merger with Canadi<n etal, the Air Canada family. It may be interesting to note that although the three of us (Vesta, Terry, Alan) had worked closely together to publish the "NetLetter", it was all done by email and we never actually met for many years. Although we all lived in British Columbia, we weren't really physically close to each other and only met on a few occasions! The NetLetter has evolved greatly over the years to a new and improved Newsletter that continues to grow. Terry prepares most of the content weeks ahead of time, and sends the next issue to Wayne and Alan soon after an issue is released. Wayne then compiles most of the content from Terry in HTML format and builds the articles that end up in the NetLetter. The first draft is then sent to Alan Rust who proofs it and makes any corrections required, adds images, if required and checks all links, etc. We then pass it over to Ken Pickford who does the final proofing. Ken is truly amazing in his knowledge of aviation history, proper punctuation and grammar, etc. Our goal is to have Ken come back with no corrections, but it hasn't happened so far. We presently have over 4,500 subscribers as of August 2017. Note: Our free 'NetLetter', is not affiliated or operated by the Pionairs or Air Canada, although many people believe that this is the case. It is operated as part of the ACFamily Network, a web site for Air Canada employees and retirees. 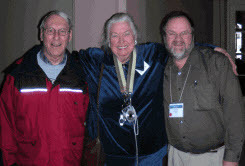 This photo was taken at the Pionairs AGM in March 2007 (in Victoria, B.C.) and was the first time the three of us had ever been at the same place at the same time.